Useful ligand for palladium-catalyzed carbon-oxygen bond formation. Ligand for palladium-catalyzed α-arylation of ketones. Ligand for Cu-catalyzed asymmetric conjugate reduction. Ligand for Cu-catalyzed asymmetric dienolate addition to aldehydes. Enantioselective conjugate reduction of lactones and lactams. Ligand used in the enantioselective cycloaddition of allenylsilanes with α-Imino esters. Catalytic Aldol reaction to ketones. 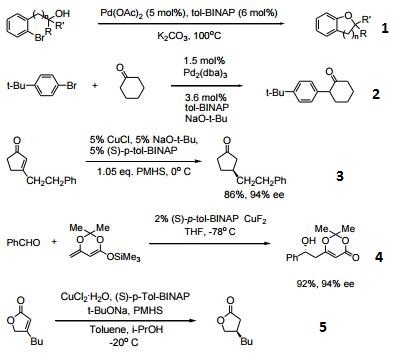 Ligand with rhodium catalyses [2+2+2] cycloaddition reaction of alkenes and alkynes. Ligand used in the iridium-catalyzed enantioselective C-H bond activation of 2-(alkylamino)-pyridine with alkenes. 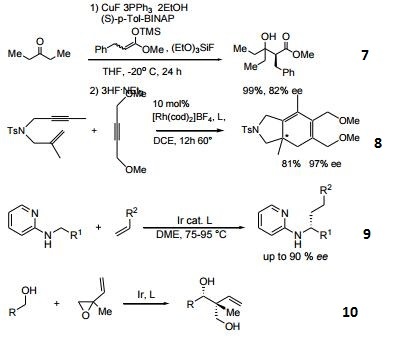 Iridium-catalyzed regio-, diastereo-, and enantioselective tert-(hydroxyl)-prenylation of alcohols. 100165-88-6 US $6.00 / kg 1kg High quality Professional Factory Ms Ella chemwill_asia@126.com www.chemwill.com Chemwill Asia Co.,Ltd.